Crocheted dolls, also known as amigurumi have become very popular in the last few years. You can make about anything you want with a crochet hook, from the very cute to the very strange. Some people have taken it to the next level by using their skills to make beautiful creations. They are a big inspiration for me to get better at my craft, and a motivation to challenge myself. Today I would like to share some of my favorites. This beautiful doll was created by Aaliyah Chang. I love everything about it, the way she made the eyes, the hair, entire outfit, and the little lamb she carries under her arm. her pose is also very cute, you can tell that a lot of love was involved in this craft. If you would like to see more of Aaliyah Chang creations, you can go to this site. The cat and the porcupine. There is so much details in this amigurumi, I don’t know where to begin. Svetlana Pertseva is a crochet artist from Russia that has so many amazing creations, I had a hard time picking just one. 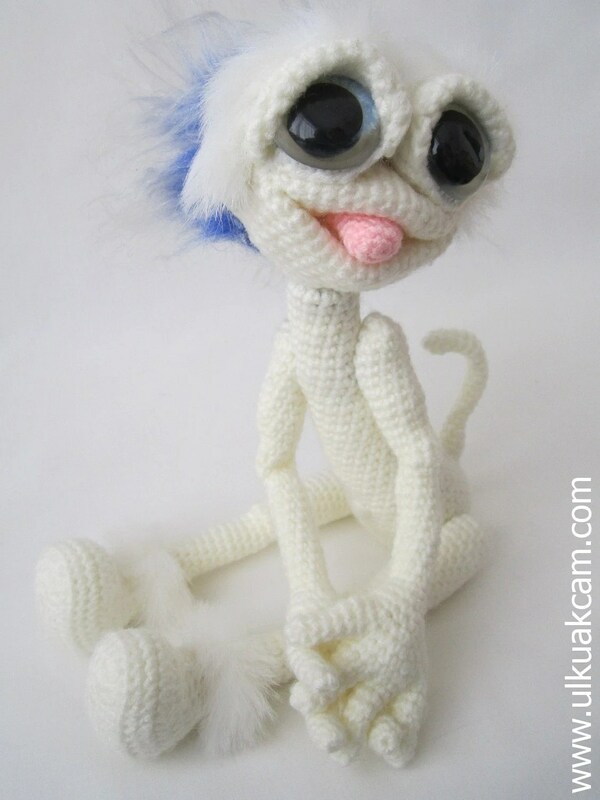 I chose this cat for his great face expression, It’s crochet brought to life. To see more from Svetlana Pertseva, you can go to her Facebook page. The amount of details put in the outfit of this doll really makes it stand out, as well as the headpiece with the flower, and the embroidery on the legs. This pretty doll was made by Kukukolki, and if you would like to see more of her work, she has a gallery on her page (Russian site). 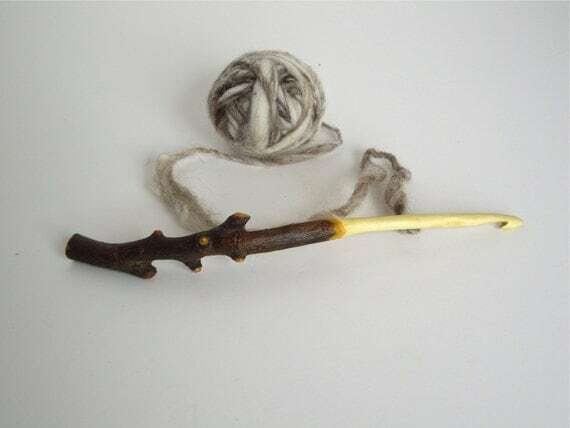 Have you ever tried to crochet anything small? It is very challenging! the smaller the object, the more meticulous you have to be. Stefanie Devlin from TinyToyBox specializes in miniature bears. I love the vintage style of her teddy bears, they are so well made, and so adorable. You can see more of her projects, and patterns at on her Crafsty page. This beautiful textured bear was crocheted by by Irina Iriss. The patterns on this plush is what makes it unique. She has patterns available, but they are in Russian. In any case, you can admire her work on her page, she is very talented. Heavenly Pineapple Angel, by Jo Ann Maxwell. This angel is so elegant, I love the roses, satin ribbons and tassels, as well as the details of her dress. This is truly a little piece of art! If you feel up to the task, the pattern is available on Ravelry. Do you have any favorite items that inspire you to crochet, or make you want to take on crochet? Let me know which ones in the comments! Today I am featuring Jenny, from JRPcrochet. She is an artisan crafter that makes really cute crochet animals that look like figurines sculpted in yarn. Here I will showcase some of my favorites, with a few questions I asked Jenny about her craft. 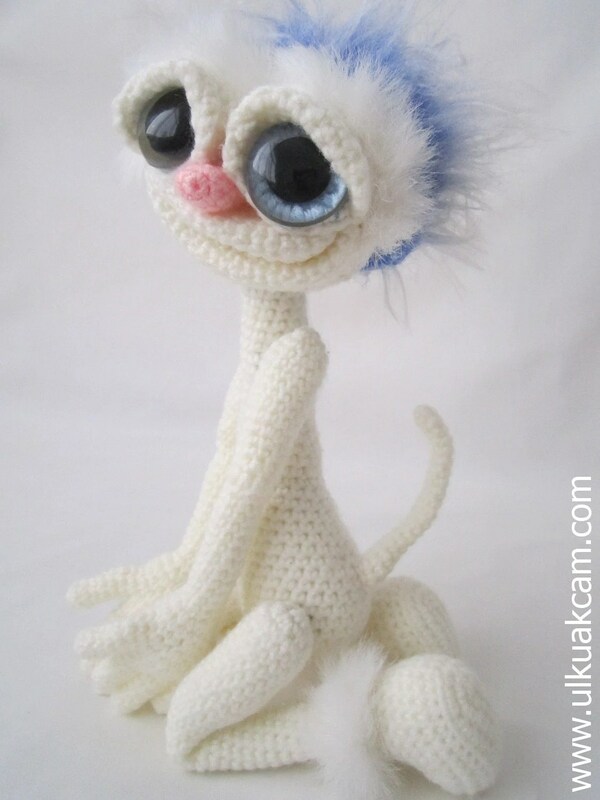 This snow leopard was made with white acrylic yarn, and colored with fabric markers. She used a pet brush to give the leopard a furry look. Her creations are made with a wire skeleton that allows them to be poseable. This fairy unicorn is available as a pattern on her ETSY shop. I’ve been crocheting for about three years this summer. I had a little experience with it when I was a kid, but it was only making chains and no real stitches. What inspired you to start crochet? I had seen cute little amigurumis for a while before I started. I wanted to buy a few from the artists I had seen, but without the extra money, I decided to give it a go myself. I found some great free patterns on Ravelry.com. I read what stitches were needed for the patterns, then looked up how to do those stitches on youtube. Once you learn a handful of stitches, you can make a ton of things. What do you like best about your craft? I suppose the best thing about crochet is its flexibility. You can make a large variety of things. Clothing, accessories, dolls, it just depends on what you want to make. You can see more of her crochet amigurumis on Deviantart-Pickleweasel360, from dragons to lamas, birds, horses etc.. Check out her gallery! Jenny also has a shop on ETSY called JRPcrochet where she sells her creations, as well as patterns if you want to make some of these lovely creatures yourself. Not long ago I stumbled upon this really interesting crocheted character called Miss Funny! It is a pattern created by Ulku Akcam, who has a pattern shop on ETSY called Denizmum. What I really like about Miss Funny is her face unique features, and her big blue eyes. She can smile, stick her tongue out, be mischievous, but not matter the expression, she look adorable. The finished doll is 14.5 inches tall. She is jointed at the neck, arms and legs. You can turn her nose into a tongue by switching it into the mouth. How creative is that? Let’s face it, she would be hired on the spot in a casting call! Miss funny goes to Hollywood. I can imagine how fun it would be for a kid to play with this doll. Miss Funny pattern is available on Ulku’s ETSY shop: 5 Ways Jointed Miss Funny Pattern. The pattern contains over 50 photos, and the finished doll is 14.5 inches tall. Ulku Akcam is a talented knitter and crocheter from Istanbul, Turkey. 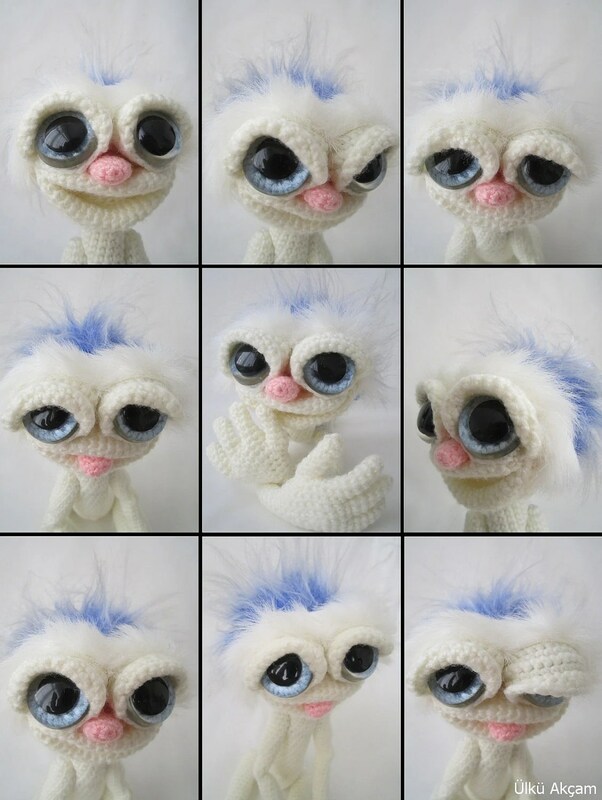 She has been an avid crafter over the past five years, and sells amigurumi as well as doll outfits patterns on ETSY. Right now you can buy 4 patterns, and get one free. Check out her work, everything she makes is very cute! The artist I am featuring today makes handmade accessories. Her name is Joanne, and she runs a shop on ETSY called Heaven Spun Creations. She makes hand made crochet hooks out of tree branches from the land of British Columbia. They are unique and beautifully crafted, this is one of the kind accessory for any crochet lover. – When did you start carving crochet hooks? Carving is a more recent venture of mine. I carved my first crochet hook just this past spring. The first few hooks that I listed online sold within 6 hours of posting. I haven’t turned back since. It is so much fun to know something that I have created is being sent all around the world! – Can you tell us a little bit about the process? The most time consuming, yet most interesting, part of the process is hunting for and collecting beautiful and interesting tree branches. 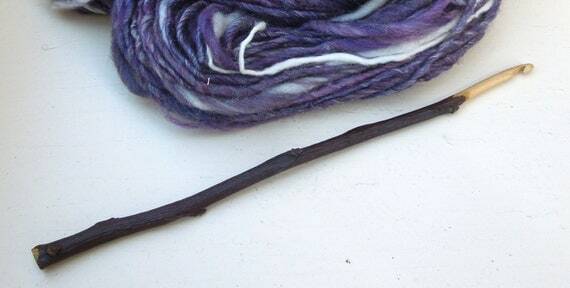 I then cut the branches to length in order to begin whittling the working end of the crochet hook to size. Careful work is then done to carve the actual hook on the branch. As a crocheter myself, I know how important it is to have a smooth glide to my yarn, so a lot of time and effort is spent sanding. I’m amazed at how smooth the hook ends become. My boys always love to touch the hooks at this point because they too are astounded at the transformation of the wood. The final phase of the project is putting a good natural protective coating on the hooks. So much work is put into making just one of these hooks that it is important to seal and protect the wood. I’d recommend wiping a little coconut oil on wooden crochet hooks once a year to keep them in tip top shape. – Do you use different kinds of wood? Yes, I love to use all different varieties of wood for my hooks. 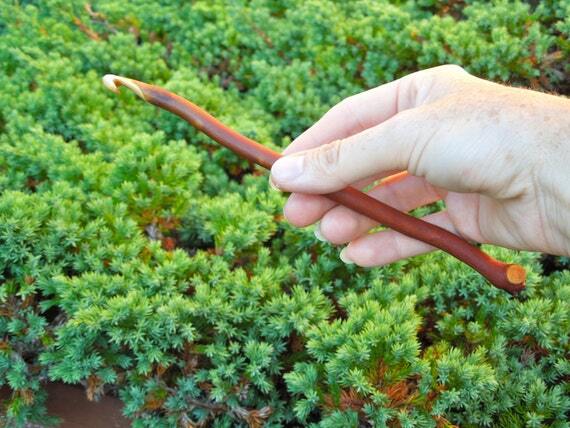 Fruit tree wood such as apple and cherry make extremely hard and sturdy hooks. I’ve made a few driftwood hooks as well. I’d have to say that currently my favourite wood to work with is arbutus wood. It is EXTREMELY hard and has gorgeous colour to the bark. I’m sure I’ll have more favourites to come. I have some Black Oak that I’m itching to get at. – Are they easy to handle? Absolutely. I LOVE my hand carved hooks. They are light weight and durable. I find the handles are often larger then metal or plastic hooks, which is easier on the crocheting hand. Wood also warms up nicely to the touch. Metal hooks tend to get cold and uncomfortable in the winter. – Do you take custom orders if someone want a specific size? Yes, I do custom orders all the time. I want happy satisfied customers. You can visit Joanne’s shop at Heaven Spun Creations. 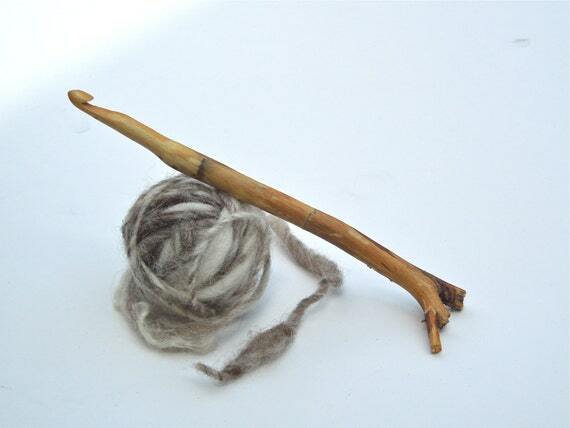 She also sell hand spun yarn, and beautiful felted necklaces amongst other things! This week I am featuring the most impressive amigurumi I have seen so far, a Skull Kid character made by a crochet artist named Evelyn, or aphid777 on DeviantArt. If you are a fan of the Zelda games, you have probably encountered this mischievous little creature in Ocarina of Time, Majora’s Mask, or Twilight Princess. Evelyn’s version of the character couldn’t be more accurate, the skill level is impressive. You can tell that a lot of effort, and hours have been put into this work. I asked Evelyn a few questions about her art work. What inspired you to make a Skull Kid? I’ve always loved the Legend of Zelda series so I’d been hoping to make characters from the games. I started crocheting almost 2 years ago so I wanted some more practice before trying to make something from the games. I had been planning to make a humanoid figure for a while and Skull Kid seemed the perfect choice and plus, Majora’s mask is just so cool! How long did it take, approximatively? I wish I could tell you how long it took. I can tell you that it took many, many, many hours over the span of several weeks. I’d say the mask alone took approximately 16 hours to finish. The mask looks amazing. You used felt to work on the eyes, and some of the details. Do you think needle felting easier than embroidery? For me, needle felting is definitely easier than embroidery. It’s much easier to control the addition of wool versus thread, and the results have been nicer from my experience. It does take some getting used to at first, but I’m sure that’s the same with any other craft. Is there any other characters from the Zelda games that you would like to make? You can check out Evelyn’s gallery on DeviantArt, and don’t hesitate to leave a comment if you like her art work! I decided to start a weekly feature to display work from other artists, dolls and plushes I fell in love with. Today it’s Kristel, or Bandotaku from DeviantArt. Like me, she’s a Cumberbabe, but that’s not why I featured her work on my blog! She made this really cool Spock, you can tell that a lot of work has been put into it. I love the details on the doll; the clothes really look layered, the hands are really well made, and I love his facial expression.. Thinking about something logical, certainly! I have to say Nimoy, though I do like Mr. Quinto very much. I went about the Star Trek fandom a bit backwards, first watching the recent reboot Star Trek: Into Darkness first, then watching the 2009 reboot, then starting on the original series. Nothing beats the originals: Spock’s true personality lies in Nimoy’s acting, but I think the new cast matches very nicely. What inspired you to make an amigurumi Spock? After seeing Into Darkness, I fell head-over-heels in love with Star Trek. I’m very much a Star Trek newbie, and I’m not shy to admit it. I was completely blown away by the movie, and I had very little expectations going into it (I went for Benedict Cumberbatch and for him only). I decided I needed to try watching some of the original episodes, and it just escalated from there. Whenever I get excited about something, I have to expel that excited energy out through some sort of creative medium. It happens all the time. And Spock is just such a unique character, I knew I had to make him. I’ve never actually clocked my work, but if I were to guess, I would say at least 20 hours, spread out over about a week. I can easily spend 2-3 hours crocheting at a time. What was the most challenging part in making this doll? The design was really hard for me. I am used to crocheting four-legged animals that stand on their own, so transitioning from making animals to making a person was a challenge. It took a while to decide how I wanted the legs, whether I wanted them sitting or standing. I looked at many other human amigurumi by other crafters online until I eventually just dove right in. I never had a good clear picture of what I wanted him to look like in the end, so he just sort of grew along with me. And I tried out some new things I had never done before, such as the hands with fingers and the detached sleeves. He was successful surprise and I learned several new techniques that I hope to use again. What’s your next crochet project? Are you going to make a Cumberbatch Sherlock? Ah, Sherlock! He would certainly be fun in his long coat. Maybe someday. Right now, I don’t have any big projects planned. I thought about making the Eleventh Doctor from Doctor Who, but his outfit is a doozy. And after finishing Spock, then working on a few commissions, I feel a little burnt-out. I just have to wait until inspiration strikes me again!